Presented by Nash consultant Jerry Hammond, this unique DVD gives grass roots anglers a real chance to find out exactly what goes in to the making of rigs. 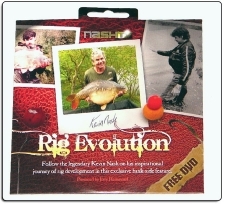 The DVD gets you inside the mind of the legend that is Kevin Nash and in detail he explains the workings of a rig. From the earliest developments of the Blow Back rig, right through to the currently in vogue Chod rig, you will find step by step demonstrations on exactly how to tie these rigs, and by the end of the DVD you’ll totally understand how they work. The Rig Revolution should be on your local stockist shelves this weekend so keep your eyes open for a freebie that’s well worth a watch.